And for You non-mom's too. Mom's are good at sharing their love. This is my GIFT to everyone in honor of all of YOU. 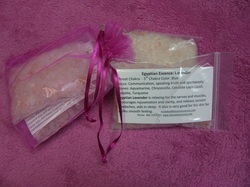 Himalayan Bath Salts come in your choice of Lavender, Rose, Jasmine or Lotus Flower. 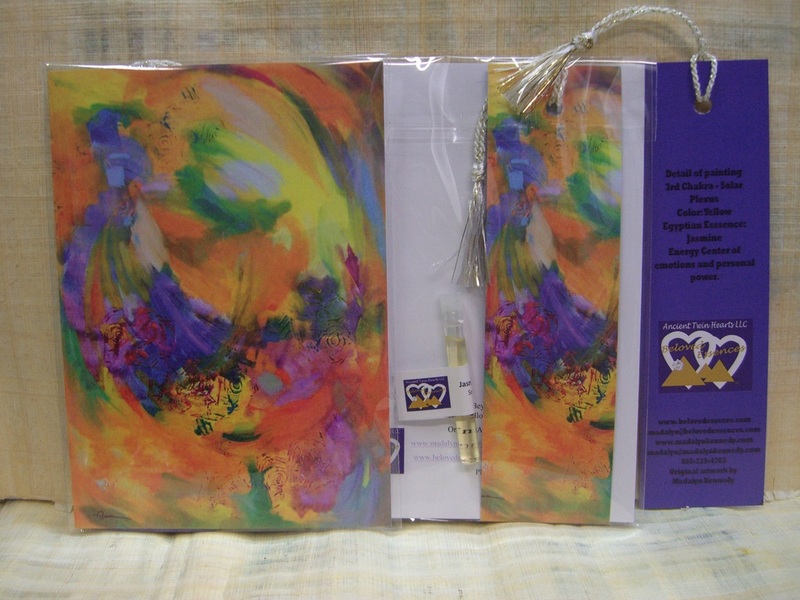 Each Essence is an individual plastic bag with information card about the Essence and the Himalayan bath salts. The organza mesh pouch is approx 4-1/2" X 6" . (FREE Gift is for on-line orders only) – be sure to state which essence you want and how many in the comments area - ex: 1 Lotus Flower & 2 Lavender. Jasmine helps to balance your Personal Power Center in your Solar Plexus. Just using a little bit of Jasmine daily not only makes you feel good and smells wonderful it will help you to clear blocked energies and align yourself more to your strengths then to your weaknesses in your Personal Power Area. The Egyptian Essences are all blessed and hold a high vibration of healing energy place upon them by the Holy Man in Giza through the guidance of the Ascended Masters. This is the image of the energy vibrational painting created especially for the Pure Egyptian Jasmine Essence and the Solar Plexus. Your Solar Plexus area controls the 3rd chakra (your invisible energy center). When your Personal Power Chakra is STRONG, you are admired for your confidence and healthy self-esteem, both in your career and personal life. You're never afraid to speak your mind, and you empower those around you to do the same. Your family, colleagues and community see you as a charismatic individual, determined to use your charisma and power for making the world a better place. When your Personal Power Chakra is WEAK or CLOSED you tend to struggle with self-esteem issues, and feelings of unworthiness. You tend to question yourself when faced with important decisions like whether to move to another city, change your career, get married to your partner or to have children. You feel like a victim in the world, and often feel powerless to circumstances and other people's desires. You may also suffer from frequent stomach pains and stomach anxiety. 4 ml personal spray "Mother's Day Special"
For all the wonderful women on this planet. And to my dear soul sister Rosalie - please get well soon. This video is so beautiful and inspiring. Such power music projects when it's from the heart. I wish you Love, Light, Healing and Happiness always.